I drag my foot in the dirt and look up at the sign. It’s not the miles. It’s the time. There is no time. Go and I’ll be walking in the dark. Skip the mountain and I’ll make the train to Freiburg in an hour. I take a few steps and stare at the sign again. My pack feels heavy, heavier than it should. It always feels heavy when I am not sure where to go. I take a few more steps. They are small. There is no heart in them. Timid steps. Steps that aren’t real. The sign doesn’t change. Signs never change. Do I really want to climb the mountain? Maybe not. Maybe I can convince myself. I rock back and forth on my heels. It’s not going to be that different. It’s just extra miles. It’s a waste of time. I think of Halti, that mountain back in Finland, out of the way, but there. I climbed it, almost on a whim, a whole day spent going up and down its slopes. Not wasted. Spent. Well spent. But this? This is no Halti. That was a magical day. I remember feeling light as air when I turned uphill and began to rise. I floated. I didn’t care about the miles. I didn’t care about the time. I only wanted the adventure. Was it midnight when I got to the top? I remember huddling in the rocks and staring out. But I wasn’t so tired then. I was a month in. I was fresh. I stare at the sign. If I go, I’ll walk in the dark. I know this. The math won’t change no matter how long I stare. It’s hours and miles and they are cold and unforgiving. I stare at the sign. I lean on my hiking sticks and draw circles in the dirt with my foot. I get mad at wasting time thinking about time. I look at the sign again. The tallest mountain in Germany outside of the Alps, I think. But it’s out of the way, four miles there, four back. Three hours. Maybe. Three hours if I walk right. But will I? Not uphill. Not with this heavy pack. Maybe it will be four or five. The sun will set in three hours. And then another hour and a half to the train station. It will be dark. I turn away. It’s easier to just go on, I think. It’s easier. Just easier. Just turn and go on. I take a few steps away and stop again. I should have started earlier today. I should have found a bit more time. Then I would go. But now I should just go on. It’s just easier. I frown and stare at the sign. Halti. I went to Halti. I climbed it at midnight and saw the moon rise for the first time in the Arctic, saw it stare down the midnight sun and demand its place in the sky. I went. I knew I would the moment I realized it was there. I had to. The soul of this whole thing demanded to go there. But this mountain? I stare at the sign again. This isn’t Halti. This is just an ambitious hill, this is nothing. It’s got a ski lift up. It’s got a road right to it. It’s easier to just go on. But the view. What could I see from the top with a blue sky like this? What wonders? What magic? I stare at the sign and frown and crunch hours and know that I want to go and know I don’t at the same time. I glance up one last time and then walk toward the mountain. I don’t turn around. The sign disappears behind me. I keep walking. Relief floods me, my pack lightens, my muscles come alive. I tell myself that I still have that same soul I had at Halti, that this is proof. But I know it was harder this time, harder than Halti, harder to remember that Tarifa is only an end, only the last step, harder to remember that the middle is the story, that the moment is the true destination. I may have the same soul, but it’s stretched thin. I know that. I can’t lie to myself about that. 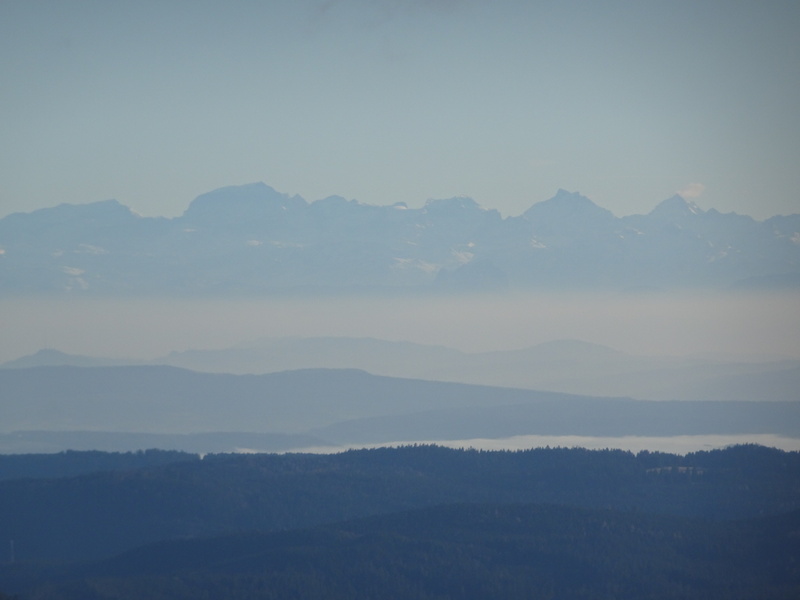 A hundred steps and I glimpse the Alps rising across the horizon. I haven’t seen them since the sunset three days ago. They fill the horizon, closer than they were, more defined, but still distant, floating over the land like ghosts. I stare and walk and climb and stare again. I think of Halti. I think of the soul of this adventure and grin at the mountains like a madman. It may be thin, it may be worn and tired, but it is not gone. I so enjoy when you let us into your mind. Well done D. That initial step seems to me is always the hardest mentally in so many things we do in life. You will not regret your decision. To CLIMB is better to descend! Years from now, you will be extremely glad that you made that decision. “…the middle is the story…the moment the true destination.” You knocked my socks off again!!! Superb writing! You are a fellow of courage and conviction. But maybe should turn west soon and avoid the highest Alps? Nice. I knew you’d go. For all the right reasons. “The middle is the story, the moment is the true destination.” Go, Madman, go! Donna and Anna captured my exact thoughts. This line sounds like the Sufi poet Rumi “the moment is the true destination.” Like your past trips, you are on a spiritual journey.